When it comes to Wedding Suits the Times they are a changin! 2.One chooses of what to wear on the big day. Did you know that Irish people are getting married later in life, often in venues outside of the church? In this past, people tended to marry in their early to mid-twenties. Today, the average age stands at 35. We have also noticed over the years, that many of our clients are getting married in places other than the parish church. They typically tie the knot in registry offices, hotels and/or other secular venues. Take a quick look at the data from the Central Statistics Office (COS). Of the 22,021 marriages that took place in 2017, just under half, 10,802, took place in registry offices, hotels and other secular settings. Of this 1,727 were officiated by the Humanist Association of Ireland, with a further 1,159 weddings being conducted by The Spiritualist Union of Ireland. That same year, the number of civil weddings stood at 6,417.The growth of a more casual type of ceremony has meant the emergence of a more casual style of wedding suit as seen below. Something Olde, Something New.On the other end of the scale is a more formal look that we see regularly. Ireland’s recent move towards greater social and cultural inclusion has allow us the privilege of kitting-out our friends in the LGBT community. We find that our LGBT clients look for diverse and complementary suiting options, often grooms men dress suits which match and complement one another. Did you know? 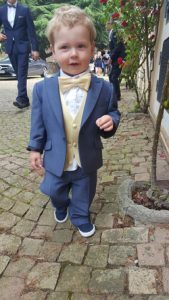 A significant majority People continue to opt for in-store sales when it comes to suits.We offer wedding suits for sale all over the world via our online channels but at the end of the day most customers still visit the store. Figures released by Retail Ireland suggest that by the end of year, consumers are expected to spend over €16 billion on on-line purchase. This will be an increase of approximately 50% from last year. While e-commerce spending is on the increase, this still only makes up 10% of all purchases. What does this tell us? The increase in overall sales significantly relates to in-store purchases, not on-line transactions. ed we do recommend face to face consultations.However we have many couples who skype in measurements and do virtual fittings with us from the other side of the world.Sometimes when you are set on your dream suit and nobody else can help you create it then you may have to do without the luxury of visiting our store! One of our signature strengths rests in our expertise regarding the perfect waistcoat. 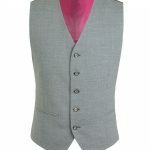 We have a strong, multi-faceted collection of styles of men’s waistcoats all draw from the major European fashion houses. But what exactly makes the perfect men’s waistcoat, how are they to be worn, and importantly, with what accessories? what occasions lend themselves best to the wearing of a waistcoat? 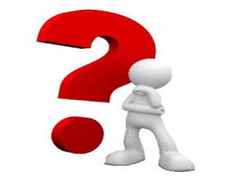 The answers to these questions will largely depend on the occasion you are dressing for. Weddings, Christenings, Graduations, all the major rites-of-passages in life will call for a different style, or more specifically allow for greater choice. Our wedding collections are expansive, we have a diverse and broad range of options, all matched in their quality and standard of cut. We’re quite the experts, and because of this we notice trends, how they develop and change. 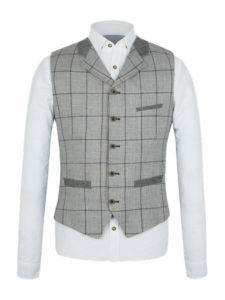 One thing seems to stand true however, wedding waistcoats are all about texture, patterns and most notably, colour. Our clients tend to choose options that are bright, light and optimistic, whites, shades of ivory, or white gold.We also see increased popularity in silver, grey, burgundy with check styled textures. 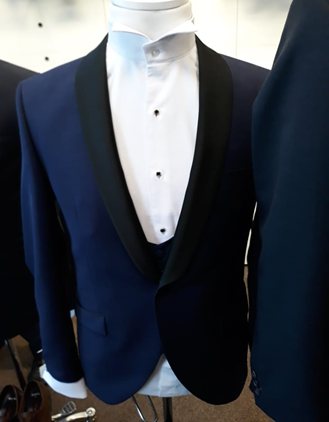 This piece is from our exclusive Gibson London Wedding Collection.It shows a classic 3 piece suit with matching waistcoat.This look is still very popular although some might find the all in one look a little uninspiring. 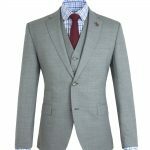 Light cut Grey summer suit, contrasting details, featuring bold Maroon lining. 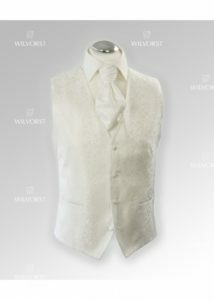 Not all waistcoats are created equal, especially pieces in use for your seminal life events such as weddings. 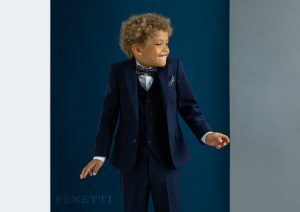 A correct choice can add a unique tint to your style personality, adding an individualistic stand-out moment to your refined, formal and professional fit.We have put together some contrast waistcoat options below.The ivory embroidered piece reached its heyday about a decade ago and sits easily inside a grey or navy suit.Still popular with classically themed weddings we have a myriad of similar styles in our showroom. 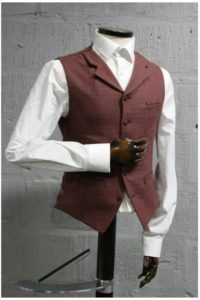 Below are some casual waistcoat options that are typical of a more relaxed style.They can be worn with jeans or chinos. 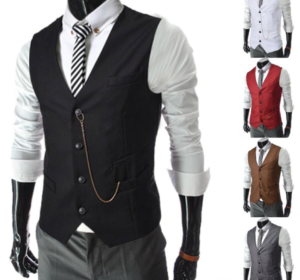 Another style is the semi formal waistcoat look. Irish graduations and weddings are littered with celebrations, something we tend to do quite well. One of the staple pieces of these events relates to suiting – often the first time some of us will wear this formal attire. It is rarely the last. Dressing for a graduation gives you a wonderful opportunity to find your own ascetic voice, your taste and look. 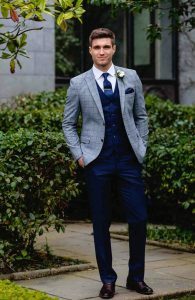 Don’t see a waistcoat wasted, choose something personal, individualistic and importantly make it your own.For some people a three piece suit is the right look for a graduation and the waistcoat is exactly the same as the suit.For others a contrast vest is the way to go.Below is an example of this from one of our recent collections. After many false dawns I finally invested in a set of light boxes and a half decent camera and got to work on our own DIY photoshoot. A few years ago we bought a lighting kit but after a few attempts that ended in abject failure they went up to the attic and were never seen again! After tormenting Paddy Barker of Barker photographic Studios I settled on a three way lighting set up and a white paper roll background. The initial stage of setting up the light boxes mechanically was the most difficult. After that came the arduous task of managing the output from the lights themselves. After a full day of experimentation we found a way of lighting the mannequins efffectively. We tested the shots on our website and we were delighted with the results. Shooting products that are of a high enough standard to go the web is no easy task.Until recently we have been using suppliers images which tend to be shot from one angle only.Our customers had been asking for shots from behind and sideways to get a better view when they were browsing from the comfort of their own home. The biggest challenge on the day was trying to keep the lights off in our home made studio as customers were in and out. Thankfully they understood and we got about 20 different combinations done. Fair play to Alex who was tremenduosly patient and proved to be an excellent cameraman! One of the big advantages of doing it this way is that we will no longer need to haul significant amounts of suits to a photographic studio. In the long run it should save us lots of time and money hopefully!Also it should allow us to showcase a lot more of our products online.Only thing I am not looking forward to in next week’s shoot is lugging all the light boxes and equipment down from the attic! I have been blogging occasionally here for the last 10 years or so.Usually my blogs are written on a scrap of paper lying around in one of my jacket pockets and then transfered to the PC a few days or weeks later.A lunchbreak or coffee break in the morning usually provides the oppurtunity to scribble down my thoughts on all things sartorial. This morning I traveled into work a little earlier to write these notes and as we speak I am sitting down on our leather sofa on the wedding suits floor with my sheet of foolscap. My blogs tend invariably tend to be about mens’suits,tailoring and little things about our wonderful store in the heart of Cork City.Sometimes I wonder why i write them and I wonder if I am the only one who reads them!It can be rewarding when a customer comes into the store and tells you he saw your latest post about custom tailoring or some famous celebrity that visited the store.In today’s world of cluttered internet posts and pieces this does not happen a lot. 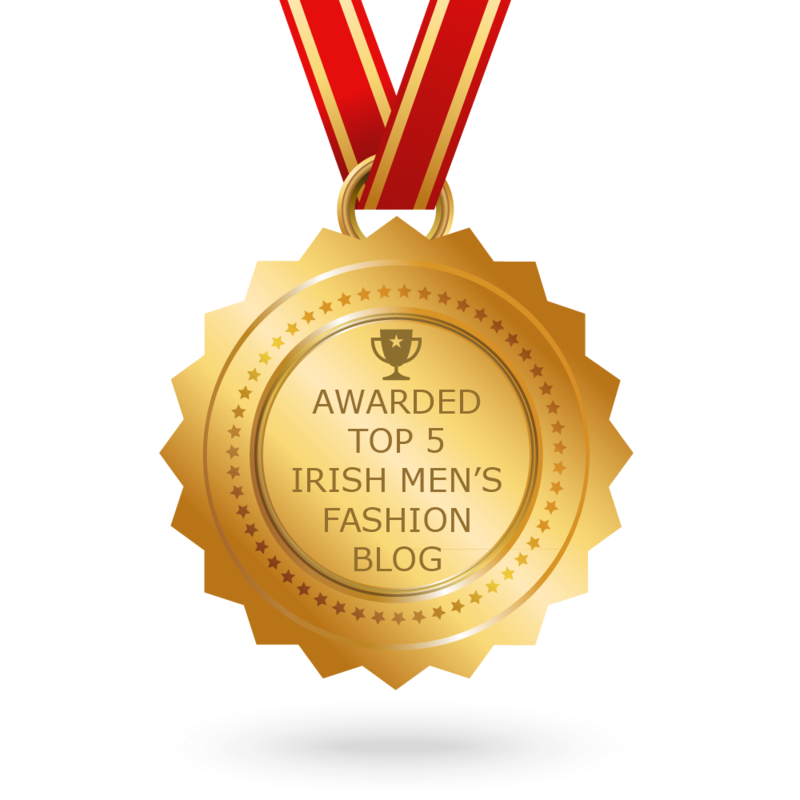 With this in mind it came as a lovely little surprise when we were named in the top 5 most influential fashion bloggers in the world of Irish mens’ fashions.Being named alongside such illustrious bloggers as male.ie was very nice and gives us a nice little pat on the back and justifies all the hours spent scribbling notes on pieces of paper in coffee houses. A nice start indeed to 2019 and hopefully a sign of more good things to come! Tom Murphy’s is one of the Munster’s premium suit rental destinations. We cater for a wide range of events, with Weddings, Christenings, Graduations, Funerals, Award ceremonies etc. being the most popular. The first in our series of hiring and rental blogs looks at all things Black-Tie, particularly the ins and outs of our tuxedo rental service. Most of us will at one point or another, be invited to attend a Black-Tie event. This means we need to find a classic tuxedo, with all the stylised particularities that comes with it. This can create a problem, while most men own a suit of some kind, (usually one that’s kept in reserve for certain occasions), many do not own a classic tux. So here you’re left with two choices, you can either buy your Black-Tie tux (something every man should own), or if that’s not an option, you may need to hire or rent one. But how do you go about the business of renting a tux for Black-Tie? The first thing we encourage you to do is make an appointment. This is not a must of course, we’re happy for you can drop into our store without a booking. But why not enquire on-line or over the phone in advance, it’ll save you time and allow us to better prepare for your visit. Once you’re in we’ll take your measurements, tailor for your requirements and advise you on what you’ll need. Once you have selected the various pieces, we will work to get everything prepared, all in plenty of time for the big-event. Our clientele would typically schedule their consultation appointment for one week to ten days before their event. Once measured and tailored, we hold the suit on stand-by for collection, usually the day before, or same day as our client’s event. Our customers will typically return their tuxedo between one to two days following the event. This timeline is more of a guide than a general rule, we fully understand that our clients may need more time to collect and return. This is never a problem, once the timeline is within reason. The cost of a tuxedo rental is in-keeping with the price range of our other suiting rental options, between €60.00 to €130.00 variable. 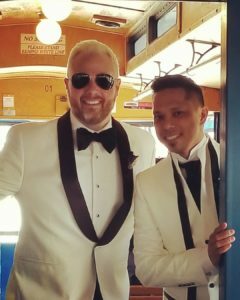 Can I Wear a Regular Suit for a Black-Tie Event? Put simply, no! Not if you want to do it right. There are several important differences between a tuxedo and a regular or standard suit. Satin: Tuxedos are typically made from satin. This gives tuxedos a finish that is easy to notice. Some find that this makes a tuxedo look more formal than regular suit wear. No Belt: You should never wear a belt with a Tuxedo. In most instances, you will be unable to regardless, as tux trousers are absent belt loops. Instead, you would typically wear suspenders or braces. These are only an option of course. Piping: Tuxedo trousers typically have piping features. These are best described as a narrow strip of satin material extending from the hip to the base of the trousers. Unlike the features illustrated above, piping is more of an option. You can choose trousers with or without this feature. Traditionally, tuxedos are worn before 6 pm. In this sense, you had tux wear for half the day, your regular suit for the other. 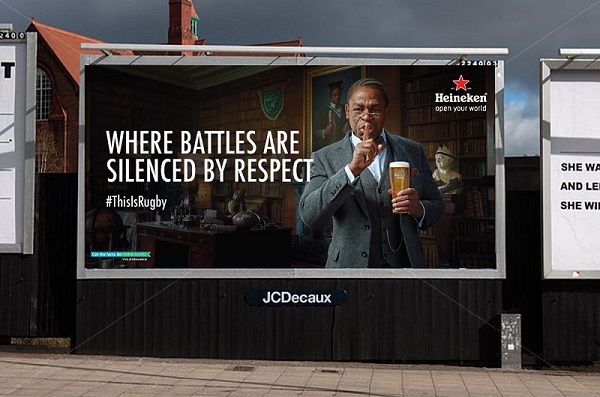 Don’t worry though, this is an old tradition that is not very popular today. You will likely only need the one outfit. The reason for the before 6 pm preference related to the formal look of the tuxedo outfit -something which is not as important for evening dinners or dancing. Tuxedos are reserved primarily for the dressiest events on the calendar– from weddings, proms, galas, balls, to formal dinners or receptions. Every time an invitation indicates black tie, black tie optional, or formal, a tuxedo is the ideal attire for men. The tux allows you to personalize your look according to your taste and style even when attending these dress-code dictating events. What makes a tux a tux? A tuxedo isn’t just a black suit worn with a bow tie. While suits are virtually made with a consistent fabric on both the pants and jackets, tuxes have much more finer details. The design of tuxes uses silk satin, which is most prominent on the lapels as well as on the pants leg stripes. Most tuxes have silk-covered jacket buttons. Moreover, they come in various colors including black, white, midnight blue, and grey among others. The name tuxedo is derived from Tuxedo Park—a residential club of mansions in the outer parts of New York. The club annual autumn ball was a crucial social event in New York, and it dress code would usually be white-tie and tails. In 1885, James Brown Potter, a charter member of the club was introduced to the idea of a dinner jacket by the Prince of Wales, who would later become Edward VII. The Prince had recently designed a new evening jacket that was worn at his country estate Sandringham. Brown Potter wore the dinner jacket, which was black but without the tails during the annual club ball. A year later (1886) Pierre Lorillard and his son Griswold designed similar jackets with satin lapels and a cut similar to the equestrian jackets. These Tuxedos soon became the customary attire for semiformal evening events in the society. 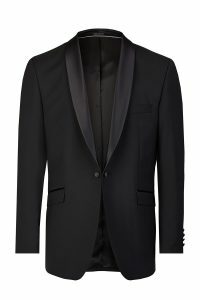 Over the years, Tux has evolved and various designs, colors, and trimmings have emerged to create a new contemporary line of tuxedos. Standard in men’s tuxedo suiting today, notch lapels are considered more casual than other lapel types. They have a notch where the jacket collar meets the lapel. It is versatile and if possible should be avoided on the most formal black-tie events. To add an elegant touch, wear it with patterned bow tie, dress shirts with fold down collars, loafers, and unique cufflinks. Slightly wider, peak lapels are viewed more formal than the notch lapel. It features edges that peak upwards towards your face and they have the effect of making you appear taller and slimmer. 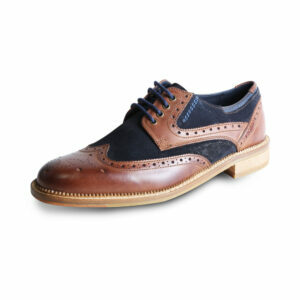 They are suitable for the most formal events such as a black tie occasion. Typically, they can be accessorized with a pleated shirt with French cuffs, patent leather shoes, black bow tie, button studs, and silk knot cufflinks. Shawl collars tuxes are characterized by a rounded, modern shape collar jackets. Although the shawl lapel is mostly found on black-tie appropriate garments, it is deemed less formal than a peak lapel. It is more panache and can be accessorized with black or patterned bow tie, metal cufflinks, cap or patent toe shoes, and shirt with fold down collars. For the double breast tuxedos, the jackets have two sets of buttons and overlapping front flaps. They are associated with everything from the 1930s gangsters to the 1980s Wall Street brokers. Today, double breasted tuxes have a slimmer cut that makes them much more flattering and creates a broadened shoulder appearance. Since they feature wider lapels, they look excellent with formal un-pleated dress shirts, cummerbund, white pocket square, and larger butterfly bow tie. Also called the “warm weather black tie”, the white dinner tux is worn mostly in a formal black tie event taking place in warmer climates during the day. 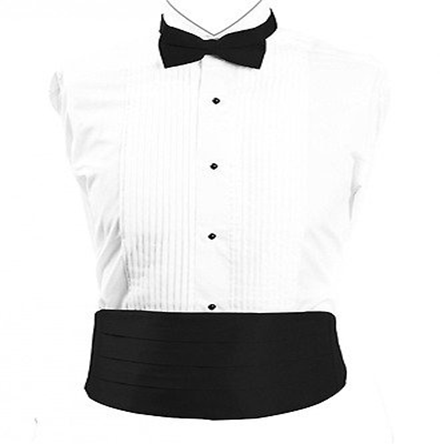 It is also worn for creative black tie occasion since it is attention-grabbing and very dashing. Nonetheless, it can be a faux pas to wear it with a waistcoat and hence you can pair it with white formal shirt with onyx studs, black pleated cummerbund, patent leather dress shoes, and black tuxedo pants. Tuxes are designed to elevate your appearance above day-to-day attire. 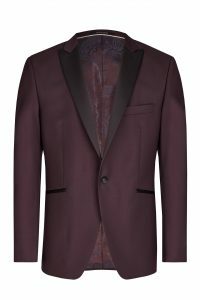 With the different types of tuxedos available, you can now dress a notch higher while going to formal and semi formal events. Tom Murphy Menswear specializes in tuxedos that are tailored from the very best fabrics and come in different and classy designs as well as colors. We have been selling unparalleled men’s tuxedos since 1938 in Cork and surrounding areas. Besides, we offer tuxedo hire services at a very affordable rate. Our popular Waistcoat, or ‘Vest’ first emerged roughly 300 years ago. Samuel Pepys spotted this new men’s garment while visiting Persia (today’s Middle East – Iran, Iraq and the United Arab Emeritus). He noted in his diary that ‘The King hath … declared his resolution of setting a fashion for clothes which he will never alter … It will be a vest.’ The rest is history. 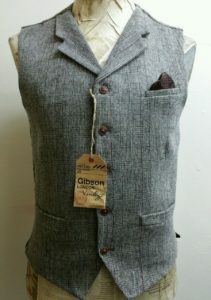 Regardless of its origins however, waistcoats have become an essential staple in any men’s suiting wardrobe. We can see why. 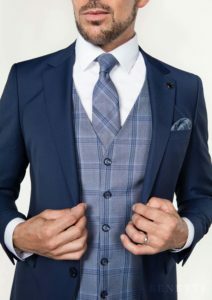 The waistcoat allows men an opportunity to accentuate a unique style, to add an important piece to a fitted, well-tailored suit. 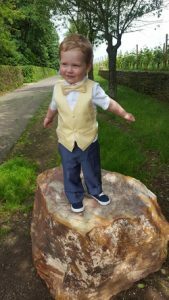 Within popular culture we have come to see waistcoats represented in formal occasions, including weddings, ceremonies and other important life events. What does this tell us? Where wear them when we need to impress – it’s our job then to help you do just that. 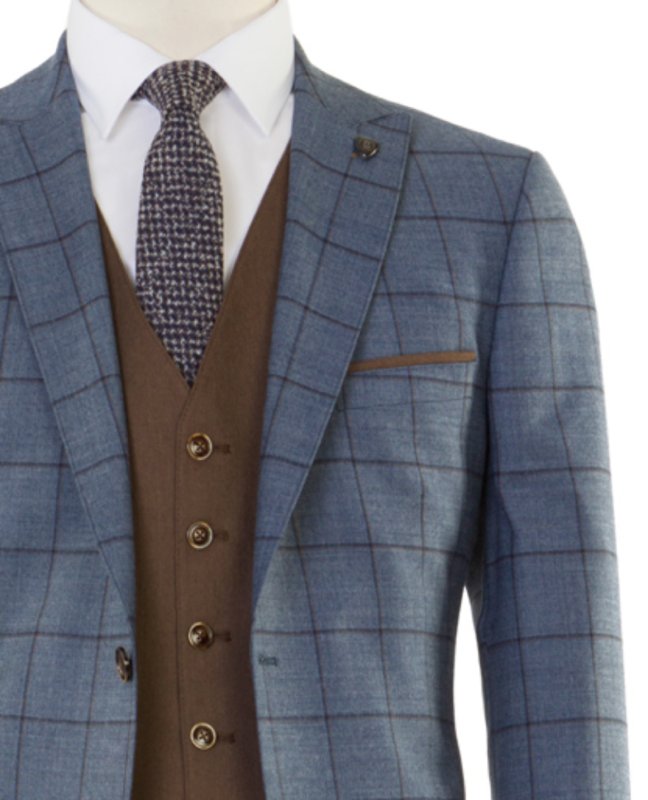 Have a look at our Edison Blue Tan Check Tweed 3 Piece suit. 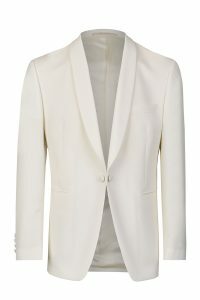 Satin Features (Most notably in the lapels, pockets and pocket trims). A tux is the garment of choice for Black-Tie events. But trends change. In recent years, we have noticed that many of our clients are opting for a tux option when attending a wedding. This trend seems to common throughout continental Europe, particularly in Italy and Portugal. It’s tricky to understand or pin down the reason for this change, but it have something to do with changing wedding trends themselves. In the past Irish, Italian and Portuguese weddings took place within a Catholic Church. This has changed significantly. With a changing venue (almost half of all Irish weddings now take place in locations other than a catholic Church. It may be the case that this is allowing people to change choice of dress and style also. Regardless of which, we’ve got you covered. Wilvorst, Royal Blue 3 Piece Wool Mohair Fabric. Our grandfather was rooted in the strong suiting traditions of the past. He developed his trade at a time when Irish society was finding its voice, its unique social and cultural place in the world. In his time, the country was locked at the intersection between the old and the new, between a colonial past and our emergence as an independent nation within the European community. He built his philosophy on formalwear suiting within this brave new world, and set the scene for us to continue this journey into the world we find ourselves today. So, what have we learned and how do we see ourselves within Cork’s exclusive suiting and tailoring community? We are suiting specialists, we’ve mastered our trade. Because of this, we see suiting is a living thing, as a set of ideas, made manifest through look and style. Each person brings their own personality to it, their own set of impressions or ideas about what fashion means to them. Over this past two decades this our clients seem to have developed a greater interest in style, a desire to choose clothing options that are more individualistic and personal. Men seem to be more comfortable asking for specifics – choices which better reflects how they see themselves and the world they live in. Where once men chose to follow trends, they now look to create them. This new-found confidence is of course a great positive, something to be welcomed. For us, this has meant that we can cater for increased choice, and importantly, use our seven decades of expertise to delight our clients. As with all luxury products it’s always helpful to know your options. This means looking at some of the key features of suit tailoring and selecting what works best for you. We are experts in this field, and as such we can guide you through the entire process. But we believe in client empowerment, in sharing what we know with you and, in doing so, enabling you to develop confidence and pride in what you wear. 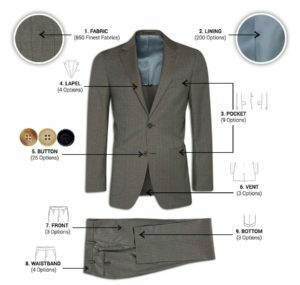 Take a look at our suiting chart below [Figure 1]. 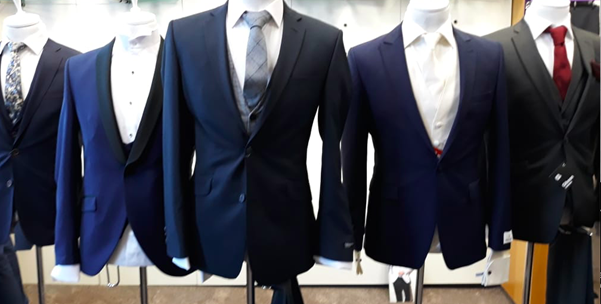 We are also incredibly proud to showcase our ‘Tziacco’ Bespoke options for the upcoming Spring/Summer 2019 season. 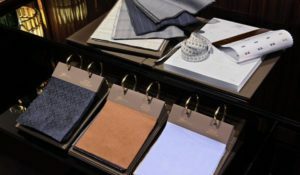 But what exactly are Bespoke and Made-to-Measure tailoring methods and why are they so important to us and our clients? 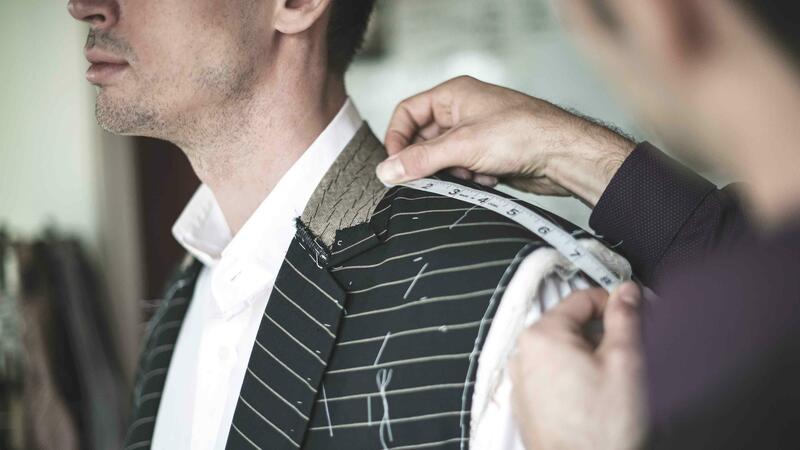 Made-to-Measure is built on principles of personalised tailoring, a process where a suit is created for you, the client. You do not need to fit into a suit, we make the suit to fit you. 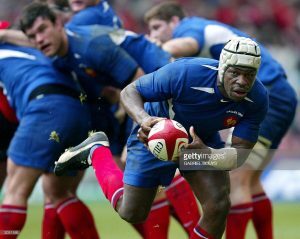 How do we achieve this? First thing is to arrange an appointment, something that can be done at a time which best suits you. Once you are in with us we will take your exact measurements and invite you to select patterns and/or designs from our material sample brochures. This is an exciting process, it is personalised, individualistic and professional. People often use the terms Bespoke and Made-to-Measure interchangeably. While these two approaches are indeed similar, there several differences to consider. 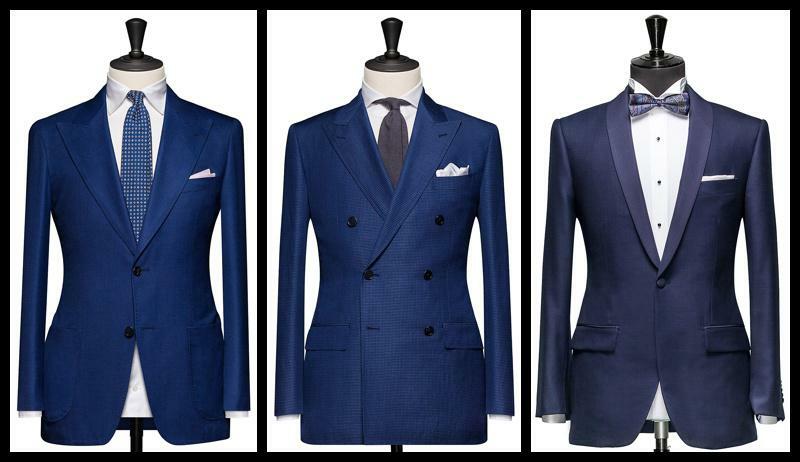 Your Bespoke tailoring experience can be more rewarding; you will have a greater choice of options available to you. With Bespoke you can choose the textures, prints, thread counts and other intricate details to construct your fine luxury piece. So now you have a better understanding of the process and methods, what type of should you opt for? Look at our three options above. Can you notice the differences? How would you rank these three options? Which options would suit you? Would some looks suit some occasions better than others? For the past thirty years or so Tom Murphys has been the place to go for suits for the little men in the wedding party.Well known brands such as Magee of Donegal were always stocked in miniature sizes and the little men were able to blend in with the wedding party.Lately there has been a trend for the little guys to be kitted out in a new suit for the big day and we have introduced a stylish collection of boys suits and the range is perfect for other big occasions such as communions and confirmations.The elite collection features beautiful luxurious Italian fine wools in all sorts of styles.We are even offering a bespoke collection for young boys.These suits come in the finest yarns and In Northeim, Lower Saxony WILVORST produces outfits for the little gentlemen – perfectly matching the wedding suits or festive outfits of their dads. 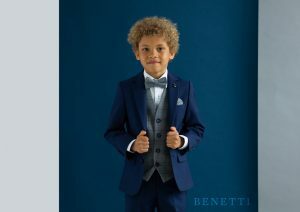 Besides the collections for men (wedding suits and formal wear)Tom Murphys in association with WILVORST also offers boys suits, waistcoats and acessories for the wedding perfectly in the style of the adults. 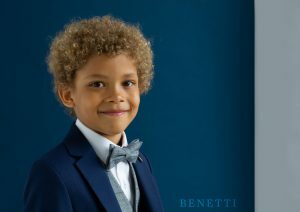 The bespoke garments are available in the retailers shop in 8 weeks delivery time.For the little gentlemen you may choose the favorite from a program of more than 1000 fabrics of high quality. 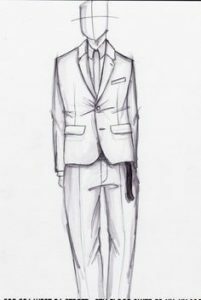 The second step of the boys suit is the style. 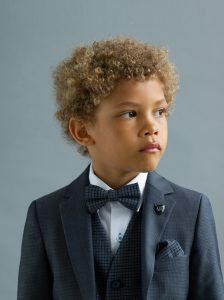 Evening tail suit, dinner suit, morning coat, 1-button jacket, 2 button, 3 or 4 button, jacket with stand-up collar and different styles of waistcoats and accessories are available. 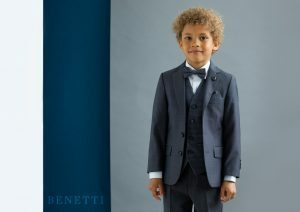 As well as the custom made designs we have expanded our portfolio of off the peg suit options for boys.We stock Benetti suits for boys and they are priced at 169 euro which makes them exceptional value.There are numerous colors available and we offer some amazing contrast waistcoats to complement the suit. We recently had the honour of being approached by one of Ireland’s leading costume designers Maeve Patterson about supplying Serge Besten with a retro style tweed suit for the shooting of the new Heineken add.After a visit to Cork Maeve and Tom went through a mood board and Tom gave her all sorts of suggestions for a cutting edge ensemble that would capture the mood and theme of the add.A couple of outfits were taken up to the studio where the TV ad was being shot.Maeve was thrilled with the combinations but alas when they tried the suits on Serge some of them were a bit too tight on his arms and shoulders.The slim fit cut of our tweeds were just too tight for the big man but there was still time for an outfit to be sourced from another supplier.Tom did get to have some of his gear feature in the ad however.The accessories were provided by none other than Tom Murphy and the Goodwin smith two tone shoes were also out of our store.So if you see the ad and find yourself admiring the dapper style of Mr Besten you know where to go to achieve the look!